View showing the presumed initials of the owner and the date 1826. 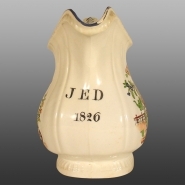 A dated earthenware jug with initials in a Chinoiserie pattern showing a full-size person in an open carriage being pulled by two small people. The transfer printing is underglaze, but overglaze enameling completes the pattern. It is rare to see a dated item in this genre, since most of the production was for the lower end of the market.